Online shopping and ever shorter delivery times place constantly higher demands on logistics, hence the need for conventional distribution and logistics processes to constantly adapt. Modern logistics warehouses have to be as compact, flexible and dynamic as possible to achieve fast access to requested goods in the warehouse, including the availability of returns directly after being checked. SSI Schaefer has extended their product range for e-commerce and omni-channel distribution with the development of a highly compact and multifunctional overhead conveying system for goods of up to three kilograms. The innovative SSI Carrier system consists of the universal SSI Carrier as the load carrier, a circulating and an accumulation conveyor as well as switches and ergonomically optimised work stations for loading and unloading the carriers, designed according to the [email protected]! concept. Standardised components can be combined modularly, variably and economically to form complex systems, which can be individually extended. The carrier combines a single drive system with five different functions: conveying, accumulating, distributing, buffering and sorting. The core of the system is the primary load carrier – the so-called carrier. The roller adapter running on the inside receives, transports and identifies different secondary load carriers such as hangers or pouches, depending on requirements. The RFID transponder that connects the goods to the carrier, controls the carrier throughout the entire system. The accuracy and error prevention of the RFID technology ensure high reliability and process stability of the system.The circulating conveyor connects individual logistics modules within a system and as a transport device, masters horizontal and vertical conveying. The conveyor uses a redundant and low-maintenance drive concept that is realised without distracting passages or clamping devices and ensures high fail-safety. A continuous chain provides a circulating option for the carrier so that the conveyors do not have to stop in case a line is unexpectedly blocked. The load carriers remain in the respective conveyor until they reach their destination again. The driven accumulation conveyor transports, accumulates, separates, sorts and buffers the load carriers on horizontal conveyors. This innovative and patent-registered concept of the driven accumulation conveyor without descending sections ensures a very gentle transport of goods in pouches. Two main advantages derive: crashes of pouches and goods that usually occur on declining conveyors are avoided and the horizontal allocation enables an optimal use of space with a compact and adapted steel structure, which can also be built up to several floors. Switches are used as diverter elements between circulating and accumulation conveyors within storage loops, the matrix sorter or for in-feed to or take-away from work stations. “The new SSI Carrier is approximately 10% smaller than existing systems on the market. 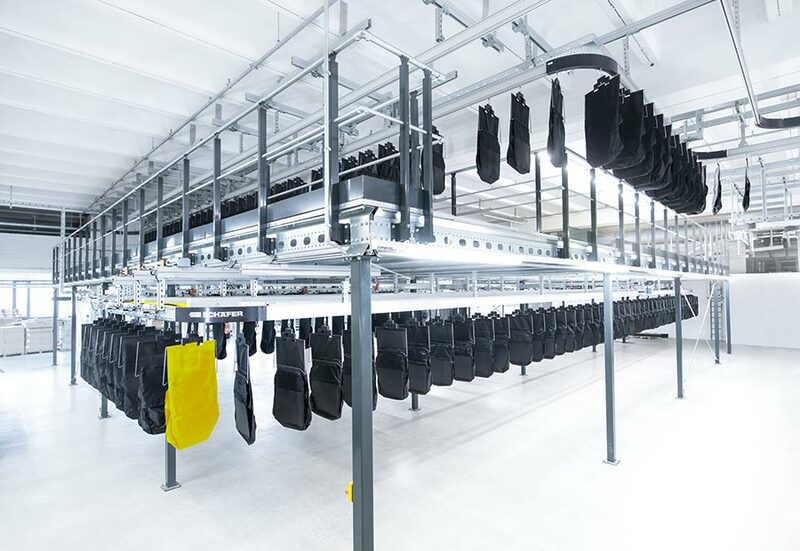 This way, we are able to buffer up to 10% more carriers,” stresses Klaus Hiesgen, managing director of HSP GmbH, the competence center for overhead conveying systems in the SSI Schaefer group. The reduced size results in increased storage density and thus the system considerably contributes increased efficiency and reduced costs. Another advantage of the overhead conveying system is the flexible and gentle transport in pouches of hanging goods and flat goods of the business areas Pharmaceutics, Cosmetics, Electronics or Food and Beverage. The speed of the conveyor can easily be adapted to the characteristics of the transported goods. A very efficient application of the system is dynamic returns buffering. The returned and checked goods are registered, placed in pouches and stored directly in a dynamic buffer for direct sales. Then, the goods are transported to a batch buffer and are immediately ready for shipping. The process ensures permanent and reliable availability of the buffered items, and meets a direct requirement for e-commerce. The matrix sorter is used for sorting load carriers in order to create correctly sequenced customer orders from batches. For this purpose, entire lines are retrieved from the batch buffer to undergo one or several sorting steps. After that, the correctly sequenced orders can be repacked at the packing stations or further processed. Based on the multi-order picking principle, fewer accesses to individual items in the warehouse are generated and the staff deployment is correspondingly optimised. In addition to processing e-commerce orders, the SSI Carrier system facilitates store-friendly delivery – this means that one single system can easily sequence several sizes of the same item for the store. The sophisticated, user-friendly software and control technology of SSI Schaefer perfects this overhead conveying system. Cutting-edge visualisation technology and optimum interfaces to the customer system ensure that it can be smoothly integrated into almost any type of warehouse. “The e-commerce business faces a highly dynamic development. Goods – increasingly also food and beverage – must arrive at the customers’ faster and faster. Performances with up to 10,000 load carriers per hour and a matrix sorting of B2C orders in this dimension and with this product variety are only possible with the SSI Carrier system. ‘We offer our e-commerce customers a cost-efficient and compact solution for large dynamic buffers. With the in-house development of the SSI Carrier and the steel structure together with the suitable IT solution, the customer receives a one-source solution at SSI Schaefer”, Klaus Hiesgen sums up.